The inaugural American Association season opened on May 2, 1882, with teams in six cities: Baltimore, Cincinnati, Louisville, Philadelphia, Pittsburgh, and St. Louis. Events leading to the Association’s opening day can be traced to the National League’s expulsion of its Cincinnati franchise after the 1880 season. Among the reasons for throwing out the Red Stockings were that the club permitted use of its grounds for semi-pro games on Sundays, charged less than 50 cents admission, and sold alcoholic beverages inside the park. During the winter of 1881–82, the Cincinnati club joined with teams in five other cities to form the American Association. About 1,500 people gathered at Cincinnati’s Bank Street Grounds for an offensive display that was not decided until Bill Tierney flied out to Allegheny center fielder Charlie Morton with two on and two out in the ninth inning to close out Allegheny’s 10–9 victory. The defeat provided a bittersweet homecoming for Red Stockings pitcher Will White, who had been a pitching mainstay of Cincinnati’s National League team. Cincinnati opened the scoring with two runs in the bottom of the first inning. Joe Sommer walked and, after Bid McPhee flied out, Hick Carpenter reached first on an error by Allegheny second baseman George Strief. Catcher-manager Pop Snyder and Dan Stearns hit to left field in successive plate appearances to score Sommer and Carpenter. In the top of the third Allegheny reversed Cincinnati’s advantage with four runs of its own. Billy Taylor’s two-run triple started the Alleghenies’ comeback. Fielding errors by the Red Stockings allowed lowed Taylor and Jack Leary to score. But in the bottom of the inning McPhee reached base on a muff and Carpenter and Snyder singled to load the bases. Stearns’s double tied the game, then Snyder scored when Allegheny catcher Jim Keenan dropped the ball at home on Tierney’s hit. Chick Fulmer reached first when Stearns was out at home, but singles by Jimmy Maculler and White scored Tierney and Fulmer before Sommer’s double-play ball ended the inning with Cincinnati ahead 7–4. Allegheny tied the score in the fifth inning, aided by Morton and Keenan, who would combine for seven of the Alleghenies’ 15 hits. The Alleghenies went ahead in the sixth when three Cincinnati errors allowed Taylor to reach base and subsequently score for an 8–7 advantage. The final of those three errors allowed Jake Goodman to reach base, and Morton’s hit two batters later scored him for a 9–7 lead. Allegheny added the 10th and winning run in the seventh inning when three straight hits scored Ed Swartwood. In the bottom of the inning, Cincinnati closed the gap to one run when a wild pitch and passed ball contributed to Carpenter’s scoring his third run of the day. Trailing by two heading into the ninth, Cincinnati drew within one run when Snyder’s one-out hit scored Sommer. Stearns’s fly ball moved Carpenter and Snyder into scoring position before Tierney’s fly ball to Morton ended the game. Despite just arriving from Boston and showing “promise of good work to come,” first baseman Tierney was released that evening. While the Red Stockings opened the season with a loss, they ultimately proved the strongest club over the course of the 80-game season. Cincinnati assumed first place on June 13, never to relinquish the lead en route to winning the inaugural American Association pennant by 11½ games. 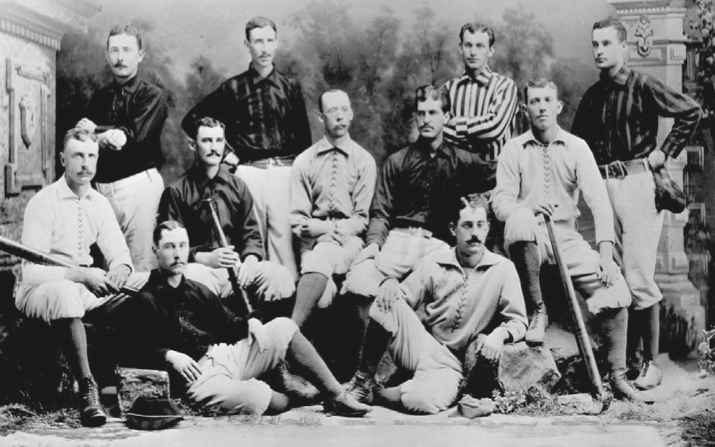 The Athletics had fielded a semipro team in 1881, providing continuity in the club’s transition to the American Association. Drawing heavily on players with Philadelphia connections, Baltimore hastily assembled its side when the club became a replacement for Brooklyn in March 1882. Played before 2,500 spectators at Oakdale Park, the game proved a back-and-forth affair. The Athletics opened with a run in the first inning. After Baltimore responded with two in the top of the second, the Athletics tied the score in the bottom half. They moved ahead 3–2 after four, but Baltimore regained the lead with a three-run fifth inning. Baltimore’s lead held until three seventh-inning runs allowed the Athletics to take a 6–5 lead. Baltimore responded with two runs in the top of the eighth from John Shetzline and Charlie Householder. Baltimore’s turn at the plate also provided dramatic moments as Athletic catcher Jack O’Brien was knocked unconscious on a foul tip by his Baltimore counterpart, Ed Whiting. To his credit, O’Brien caught the ball before collapsing and resumed play after a delay for treatment. In the bottom of the eighth, the Athletics closed out the scoring with four runs for the final 10-7 tally. While Baltimore threatened in the ninth with two baserunners, the game ended on Whiting’s strikeout. Of the 18 players to appear in the game, all but Stricker managed to get at least one hit. The Athletics also won the next day, pacing themselves to a second-place finish over the course of a season in which they never fell below .500. Baltimore lost eight of its first nine, and was an almost wire-to-wire last-place club. Behind pitcher Jumbo McGinnis, the Browns opened with a 9–7 win over the Louisville Eclipse at Sportsman’s Park. While striking out seven Eclipse batters in gaining the win, McGinnis also threw six wild pitches. Some responsibility for his wildness was placed on catcher Sleeper Sullivan. McGinnis helped his cause with two hits. Charlie Comiskey, Oscar Walker, and Jack Gleason each contributed two hits and two runs to the Browns’ offense, while Walker received mention for three hard-running catches in center field. Gleason, at third base, and rookie Bill Gleason, at shortstop, became the first brother tandem to play in the same infield in the major leagues. The Eclipse were hamstrung by an inability to string together consecutive hits until the ninth inning. Guy Hecker (4-for-5) and Dan Sullivan (2-for- 5 with 3 runs) provided what existed of an Eclipse offensive punch. Third baseman and eventual batting champion Pete Browning suffered through a 0-for-4 afternoon while committing half of the Eclipse’s eight errors. St. Louis also won the next two games between the clubs, allowing the Browns to open the season with a sweep. Over the course of the year, the Eclipse recovered to take nine of the 16 games between the clubs in staking itself to a third-place finish, while the Browns finished fifth. Cincinnati Commercial Tribune, Cincinnati Daily Gazette, Daily Inter Ocean (Chicago), Philadelphia Inquirer. Nemec, David. The Beer & Whiskey League (Guilford, Connecticut: The Lyons Press, 2004). Nemec, David. The Great Encyclopedia of Nineteenth Century Major League Baseball (Tuscaloosa, Alabama: University of Alabama Press, 2006). Thorn, John. Baseball in the Garden of Eden: The Secret History of the Early Game (New York: Simon & Schuster, 2011).